Home / home renovations / my home office / wallpaper. / My NEW home office.... finally complete !! My home OFFICE renovation is now complete & I am so ECSTATIC with the results! It feels bright & calming...two things I was aiming for throughout the whole process. 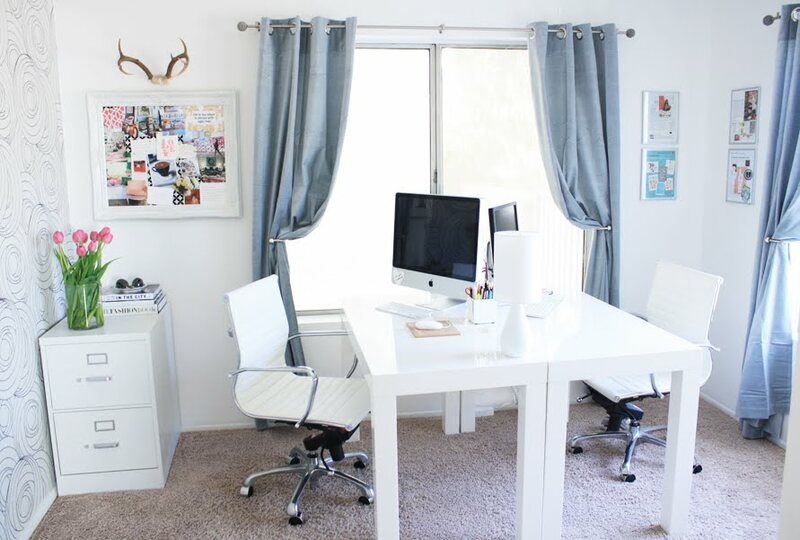 I really hope my new home office will inspire you to perhaps re-decorate your own! For those of you who are NEW to my blog, you can see the before pics here as well as the renovation in progress here. I absolutely love your new office! It is so streamlined and fresh! Great job! Gorgeous! So fresh and beautiful. You really did a fabulous job and it has really inspired me to change a few things of mine. Thank you! LOVE it. Such an inspiration for me, I'm very much a minimalist and I love bright white spaces. Good work! I'd live to work if it was my space! Beautiful office Jen. Very clean but still sassy! Simply gorgeous! You have a great eye for interior design Jen! Jen! I follow your blog from Argentina!!! and let me tell you that is absolutely beautifull!!!!!!!!!!!!!!!!!!!!! you have great ideas!!!! it so much inspiration here! Yes it has certainly inspired me to brng about chnges in my environment.. this place looks great.. i absolutely love your inspiration board..it truly is an inspiration!! Thank you for following my blog and for your compliment! OXOX! Love your inspiration board... and your new clean shelves!!! Jen, your new office is beautiful!!!! Love the light you have now, just perfect!!!! It looks fantastic! Your inspiration board is fab. It would make me want to work! Ha! Looks fabulous Jen! I love the wallpaper and those blue curtains are beautiful! Great job! Amazing! I really love that wallpaper! a new space is so exciting! You definately created the look you were looking for, great job, it's fabulous! Just a thought-have you thought about adding some molding to the top of the bookshelf that your husband built to give it a more built in look? Again, it looks great!! i am so inspired i can barely stand it! Gorgeous, amazing, beautiful! are the 2 desks for you and your husband? i love how bright and cheerful the room is. Love the new office, nice and bright. The wall paper is great too. Absolutely perfect! I love the wallpaper and the curtains! I'm so glad you kept the chair and now you have two ! It's really pretty. it looks awesome as i knew it would! good job! It looks awesome and I'm totally inspired to work on my home office now! Thanks for posting! It looks fantastic Jen! I love the wallpaper and the curtains, and the splashes of colour are lovely. Love your office! I'm sure you'll get lots of inspired work done in such a beautiful space! I love it! The colors are so fresh and clean. I am so jealous right now! It's so gorgeous and bright - I love it. awesome. great job. that wallpaper is delicious. I LOVE it Jen! So bright and inviting! I can't wait to do my Paris room! You just inspired me to redo my office space! that's so gorgeous jen well done!! What a nice, bright space! I was just looking at that wallpaper the other day for my powder room. I really love it - it looks great in your new office. love it!! its gorgeous! my hubby and i share our office too and are thinking of setting up the tables like yours too. great work. i AM inspired to do ours soon. enjoy!! The office looks fabulous!! It looks so crisp and clean. I hope you enjoy your new space!! Your new space is truly beautiful!! I am a fan of blue and white...so calming, cheerful, refreshing and very inviting!! Congratulations to you and a job well done Girl!!! Now go and create with a fresh outlook and lots of WOW factor!!! I seriously love this!!! I happened upon your blog when looking for inspiration for doing up my room, and I am so inspired by everything on here! The colours are just so happy, calm, relaxed and fresh! I love it! This is an amazing office space! It looks like the perfect place to be inspired, get work done, and be organized at the same time. I am very jealous! P.S. the wallpaper is fantastic! simply wonderful! i'm totally inspired to change my home office now! start a new year with a new space is all we need! i loved the wallpaper! jen, would you recommend nice stores related to decor in nyc? i'll be there next month for the first time and would love to buy some different things to my house! Looks fantastic! So pretty & fresh looking. Great job Jen! I love it! So clean and stylish. Enjoy your new space. Luv it to pieces! So crisp, bright, & sharp~ Go Jen! Oh my goodness!It looks so refreshing and great and inspiring. great job! Jen, it looks so different and is absolutely gorgeous! I loved the wallpaper and the flowers... I love fresh flowers!!!!! AMAZING! What an inspiring space to work in. Stunning. It must feel so so so good to work in there. That's an HPC5180 all in one printer. It's pretty good...but no, that is not what i use for my cards. I have a commercial printer for the cards and sometimes I source it out, depends on quantity. simply gorgeous! love, love, love your new home office to bits. and i absolutely love your blog too- so inspiring! What a beautiful space, and a great accomplishment. Job well done!!!!! Absolutely LOVE IT!! Beautiful. Oh, love your blog too! LOVE it! So light and bright! And the wallpaper is so perfect. Awesome job. that wall paper is to die for, and all of that shelf space makes me drool! Looks so great! Amazing job! Lovin it! there must be good West Elm karma out there b/c I just bought the white parsons desk today! Great moodboard and wallpaper! Love it! I'm working on mine at the moment too... it is mostly black and white and French/antiquey. It always comes down to how well you can hide those computer cords - you've done well! YESSSSSSSSSSSSSSSSS JEN!!!! BEAUTIFUL and looking at the 63 other comments lol you already know that!!! You did a MAGNIFICANT JOB! Can your husband hook up with my husband and teach him how to be FIX IT PERFECT! I need a bookshelf wall unit ASAP. YOU GO GIRL! Fantastic job! So fresh, and open and bright...love that wallpaper! How are you loving your West Elm desks? I am contemplating buying the parsons desk for a couple of years now...I am so inspired to overhaul my home office space now! it likes like a brand new room! turned out great!!! obviously i am the 100th person to say this to you...but i love it! the wallpaper is gorgeous, your curtains, the clean lines. love it! love it! love it! kudos!! So lovely! Great Job! Love that wallpaper! I love it Jen! It is fresh, streamlined and chic. Congrats. Oh my gosh, I love, love, love it!!! It's just so PURE and BRIGHT! I love it! I can't wait to see what comes out of your studio now! 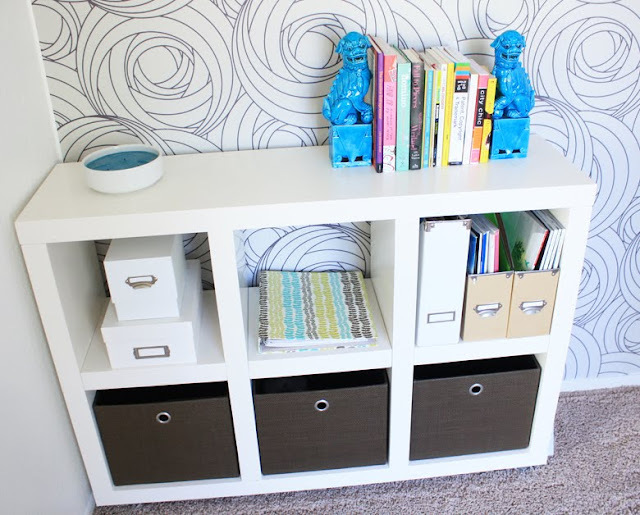 Congrats on a fab DIY project, color me impressed. What a joy it is work in such a beautiful space! From the wallpaper to the curtains and furnishings...great job. Your husband gets an A+ for the bookcase!! Keep'em working girl! Beautiful!!! It looks soo calm and invigorating! love your new office...i am definitely inspired! window view is always a plus :). Looks great! So light and airy! And organized! it's so fresh and bright. I love it! LOVE it! i've been checking back everyday to see ur new office! fantastic job! Lovely....I really admire people who can work in a streamlined way....my studio is more like a trip through the circus...lol. Oh good grief...it's beautiful! 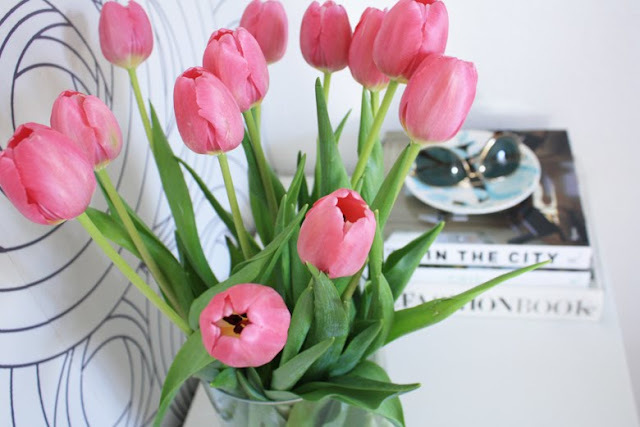 I am in LOVE with the wallpaper...and the desks...and the chairs..and the pink tulips...and the bookends...and, well EVERYTHING! Good job! I LOVE it! I really liked your old office too, but this is so bright and cheery.. definitely you! I love all the natural light it lets in which I didn't notice before... and cant believe its all DIY! It's definitely getting me motivated! I really like the WEST ELM desks...they are the perfect size and they look so spacious and clean! Gives any space a modern feel right away... :) I say go for it, you'll love it. They are on sale online from what i saw today. Love it Jen...so fresh and clean..you go girl! and big ups to hubby for putting in work! 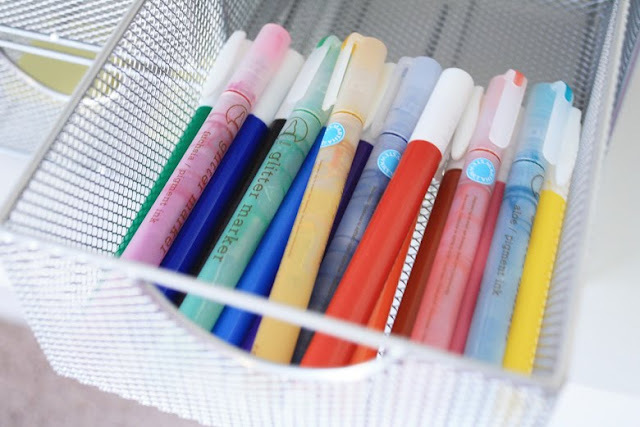 where can i find those markers? That wallpaper is da bomb! Gorgeous, love the colors. Those tables are such a great idea. Great job! Looks amazing! Well done, Jen! It looks gorgeous, love the wallpaper! Jen - it looks fabulous you must be delighted. Despite what a headache wallpaper is to put up , the end result is so worth it! It looks so clean and chic Jen, I love that wallpaper it really does something for me haha. Jen, it's just gorgeous! So lovely bright and calming, a beautiful workspace. Oh my goodness, this is so beautiful! I absolutely love how the curtains make the whole space look more elegant. So nice! I'm sure this place will bring you tons of inspiration. Any ideas for small Office/Guest rooms? looks fabulous. love the wallpaper & how airy everything looks! love love love the wallpaper. Esp w/ the splash of pink tulips! I tried to click on the pixelimpress business cards... those are great. The link doesn't seem to be working. where can I find them? It looks gorgeous. I just can't get over the wallpaper. The wallpaper is divine...and I love having two mirror desk spaces. Great job! Looks beautiful! What a fresh and happy place to work everyday. I love that wallpaper. What a beautiful job! I love that your husband made the shelves and you got the perfect desk (I like that it's done like a partner's desk). And, of course, the antlers are a nice touch. I LOVE the color palette and the wall paper - soothing and a little funky and sophisticated all at the same time. Awesome! Wow! I love it. So clean and crisp, yet it still has a ton of personality. It looks very light and bright! Amazing! Breathtaking, organized and beautiful! it's gorgeous in a 100 ways. So light and airy! Such attention to details and most importantly lots of space to grow (shelves and such). Love it! may Genius pink genius our deep fushia or so stone a strong grey , on the back of the shelves ? It is perfect! I'm now inspired to change my office/Olivia's playroom into something a bit more inspiring. O.M.G. I knew it was going to be amazing, but this BEYOND lives up to my expectations! wow this is absolutely stunning!! great job on the renovation! it must feel good to be DONE! we're currently working on renovating our basement and its just taking forever. i have no idea how to decorate it either, i need HELP!! I love it. Simply inspiring! You rock Jen! Jen! It's absolutely beautiful and inspiring! This will definitely help me out in my own workspace re-design. I love the two parsons tables together and your soothing color palette! Enjoy your space! Ooops! Sorry about that. Pixelimpress link should work now! :) Thanks! Wow!! your office is absolutely beautiful! I love how spacious, colorful, and organized it is! Great job! I'm sure you will get tons of work don there! I adore it. I am in the middle of my studio make over, so thanks for the inspiration to finish. Ummm, what's not to like. You did a BEAUTIFUL job. Your home office turned out beautifully; the wallpaper is one of a kind! Beautiful! Your foo dogs make me smile and I love the idea of two desks facing each other! Gorgeous Gorgeous Gorgeous. You did a beautiful job. Tons of people have commented on this but I wanted to throw in my grain of salt: AMAZING! Love the wallpaper especially. It's such a bright, airy and inspiring space in which to work! love it! So fresh and clean. I love the wallpaper! oh i love it. it's very inspiring, my office is always the last room i decorate, and that makes no sense since i spend so much time in it. Love it! Hope it proves to be a productive and inspiring space! I´m from Brazil (Rio de Janeiro) and i really love your blog! Your office was beatiful and i was wondering if it could be better..
I´m starting my own blog and yours it´s a inspiration every day. Wow, that was actually pretty quick if you ask me! I love all the white with spots of bright, happy colors. Very clean. Did you lose some storage space, or just store everything more efficiently with the renovation? P.S. love the turquoise book ends. OMG it look soo great! I bet your are just too excited! I cant wait to see how this space inspires you! ADORE - LOVE - FAB!!! You have done your job, I'm inspired! Gorgeous new banner. Love it. And the room is not bad either. I have the West Elm Parsons Desk...a recent purchase that I love! Also *love* your wallpaper. So chic! it looks fabulous jenny, exactly what was expected! I loved your office look before and did wonder why on earth you'd want to change it, however, having seen the re vamp I am incredibly jealous and understand why you did it. It's so bright and clean looking which is always a great working environment and that wallpaper....gorgeous! I'm also loving your business cards, the design is great but it's nice to see something other than rectangular. Your office is gorgeous Jen! What an awesome place for you to work and be creative. Love the markers and your inspiration board!!! its looking great and peaceful ... Great Job ! love your new office. very nice! Well hello! I've discovered you today and I'm amazed by your blog! I simply love it! :) The images ar great, and your taste is so fresh! Congratulations on this makeover! Fab redo! Where are the chairs from? I love you new office. You have very good taste. I adore the color selection. Congrats! In this moment i'm full with Envy....rsrsrs (the good one).I want!I want!I Want! I'm in love with the new office. I like to keep things minimalist and clutter free myself. It looks so fresh too. Must be heavenly working in there! Welcome & hope to see you back! It looks absolutely beautiful!!! Thanks for visiting my blog:) Have a nice day! Congratulations to your new home office. After seeing the pictures before and after I must say that you did the right decision. I realy like the white with the colourful accessories. Now it looks fresh, bright...just a nice area to work. He creado un post en mi blog con tu nueva oficina. Espero que no te moleste. Por supuesto, he puesto un link a tu página. Gracias y felicidades por el buen gusto. It turned out beautifully Jen!! Love the desks! P.S. You're on my blogroll, been following you for quite some time! Keep up the lovely work! Wish you could come by my place and make it look so chic! Awesome job. I love this!!! I hope you dont mind me blogging about it. Love the antlers over the inspiration board. Where did you get that beautiful white frame? I was searching for ornate frame...however it was originally GOLD,i painted it white. white colour looks perfect at your office, so fresh and calm..
for the boutique ı m going to open soon in cihangir/ istanbul, ı took lots of inspiration.. I just found yours through censational girl, love your office!! I agree... Life is too short to dance with ugly men! STUNNING AND REFRESHING! I LOVe this space and that wallpaper is killing me with it's absolute COOLNESS! Love your space! So crisp and clean! Love your space, especially the bin for your Martha Stewart markers. Very clean and well designed! Love it!!!! I have been coveting that same parsons desk for a few months...also love the antlers, such a fun twist!